Thanks for a wonderful product. I can’t believe that after just 10 days, most of my arthritic pain has abated. It used to be that if I kneeled down in the middle of a room, I couldn’t ever get back up unassisted, but now, I can squat and rise with no help at all. It’s quite amazing and again, thanks. I decided to try Rose-Hip Vital myself for arthritic shoulders and neck from years of heavy lifting and being over 50. There has been much relief, plus a bonus of leg cramps reducing and general well-being feeling. Ivy the dog is 16 and within days, I noticed a big improvement and was able to stop tramadol treatment and just use Rose-Hip Vital Canine. Ivy could run and play again, panting stopped because of being out of pain. Ivy is a very fussy eater but readily eats the RHV on food, which didn’t happen with other products tried. The dog myself and horses will all continue to take RHV with another filly going on it too. After taking Rose-Hip Vital, it has improved my arthritis pain. Just dropping you a line to say how very much I like your Rose-Hip Vital product. I have just celebrated (for want of a better word) my 80th. I have been suffering with arthritis for a few years and naturally, it gets worse. After trying several medicines and treatment, I read an advertisement for your product in a magazine and tried it. It’s wonderful. I can’t believe the relief I am experiencing. Thank you. 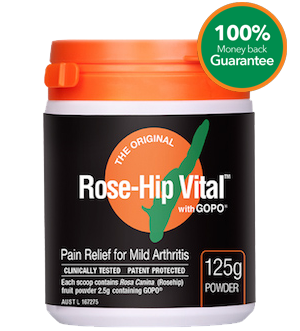 We are pleased to receive from you our first delivery of Rose-Hip Vital with GOPO this week. Because we are both afflicted with arthritis, we are constantly on the lookout for something that will ease this discomfort. Quite by accident through a small magazine we receive from the UK, we came across your product. It was given a very good write up from a 90 year old lady who reluctantly was encouraged to commence taking it for her problem, and wonder of wonder, it was a complete success. Of course, we ourselves were glad to also try this Rose-Hip treatment and I am pleased to say we also found that it was extremely beneficial for our own health problem also. We are glad that this is available for us in Australia. Following my phone call yesterday, Roy of Highfields is putting pen to paper to say what a marvellous product Rose-Hip Vital is. After being on these capsules for 3 months, I no longer suffer the pain and inflammation of arthritis. After firstly confirming with my doctor before I took them, she told me she already had patients taking the capsules and getting relief. 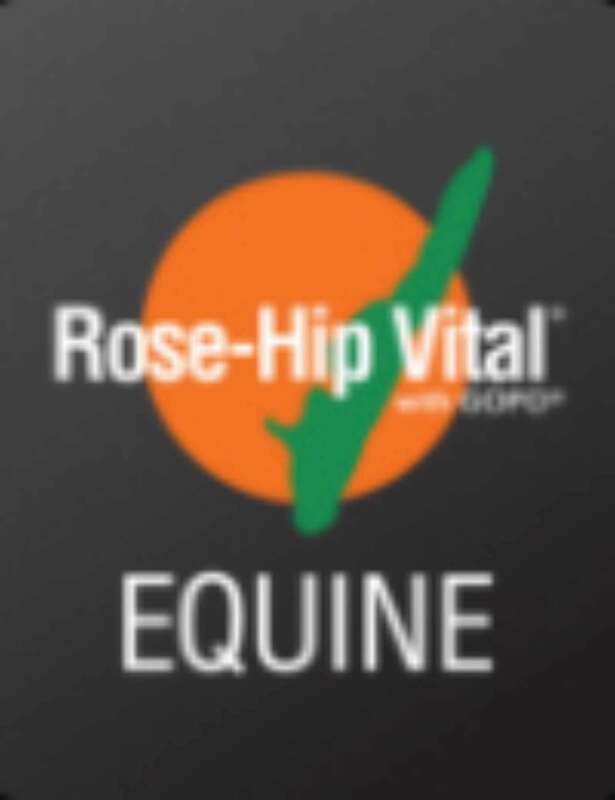 So many people all over the world will benefit from your wonderful product Rose-Hip Vital. I have already told my brother in the U.K., my son in N.Z. and many friends and neighbours here in Highfields and Toowoomba. I thank your company and laboratories for doing the clinical trials to get this product on the market. I remain your truly and sincerely, Roy. I have suffered arthritis for many years however, last winter was my worst year ever. After trying just about everything available on the market, my wife saw an article in one of the local papers for Rose-Hip Vital and she suggested that I buy some, which I did from Martins Pharmacy at St. Marys. 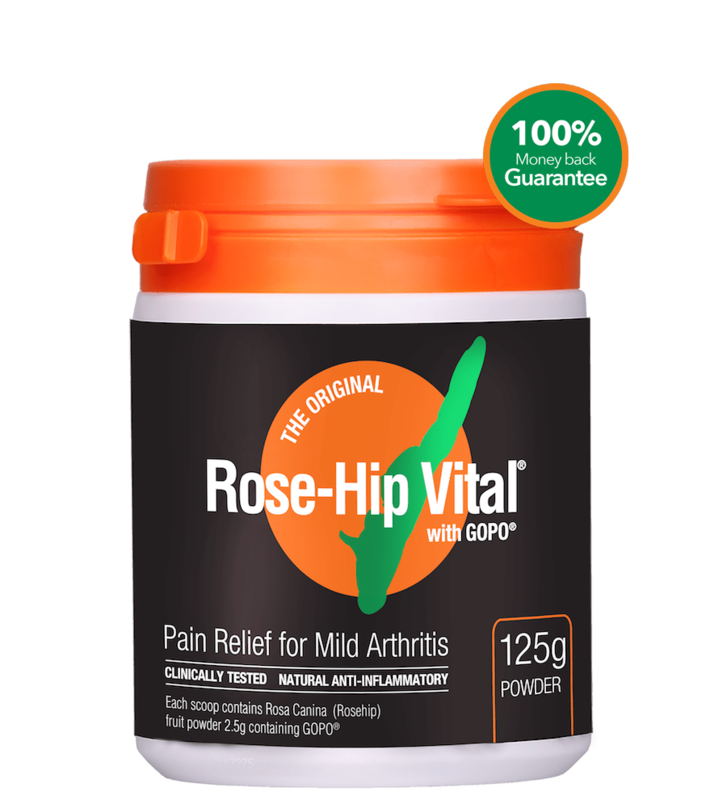 I have been taking Rose-Hip Vital now for 6 months and I have found that this is the only product available that has made a tremendous difference to me as I suffer very little discomfort and pain. I cannot speak highly enough of your product. In fact, I have recommended your product to quite a number of friends and others in the community. I am only sorry that this product was not available many years ago and, I will keep taking it until I depart this earth whenever that will be. I reside in the Penrith area which as you know is a very cold and hot area of Sydney, which at times is a very unpredictable. Since taking Rose-Hip Vital my arthritis has improved immensely, and has replaced all other Doctor’s medication. I have recommended it to my family and friends. Thanking you. I find Rose-Hip Vital very good for the pain and swelling I was having before I took it. I have been taking Rose-Hip Vita for four or five years now. I know it does not get rid of my pain, but the relief I get is worth me taking it all the time. There have been a couple of times when I have ran out of Rose Hip Vital and I have noticed the difference between when I take it and when I don’t. The pain is much more severe when I don’t have Rose Hip Vital in my system. It feels like a cross between meat ants biting me and bee stings. With Rose Hip Vital in my system, I can cope and get on with my day to day activities. Hi, i have had my two dogs on rosehip vital for some time they both have the ivdd. Sadly I lost Chester a year ago to a cancer but up until then no medication for both. My other dachshund Leo is still going strong, so I decided to try for myself as I have hashimoto’s disease (This is when the immune system cells attack the thyroid gland, and the resulting inflammation and destruction of thyroid tissue reduces the thyroid’s ability to make hormones, Ref. Better Health Vic) and have had car accident when I was young so inflammation is really bad for myself. I have been on rosehip vital for a few months now and I am back in to my running/walking 20km a week – it has given me back my energy. Thank you regards Jo K.
My 81 year old neighbour swears by Rosehip Vital for his arthritic finger joints. So I decided to try it, what did I have to lose? I’m only 41 but my left knee aches and I have 2 bulging discs from a career in nursing and for the last year have had an almost constant stuffy blocked nose and was relying on multiple uses of nasal spray as I can’t stand having a blocked nose. This is not the result of hay fever, as I’m convinced it’s caused from general inflammation. Anyway, after 3 weeks, I noticed a marked improvement in my knee when walking down stairs and my blocked nose reduced its stuffiness by about 80%. I’m down to 1 dose of nasal spray instead of approximately 5 or 6 times a day! I’m so happy I don’t have to keep using the nasal spray as I know I was overusing it but had been desperate. My back pain has reduced in severity and I’m down from 3 to 4 doses of painkillers a week to maybe needing them once a fortnight, amazing. As a super unexpected benefit, my period pain has reduced in severity. It’s been 9 weeks now on the Rose Hip and I’m never stopping. I take a maintenance dose of 6 tablets a day, as I hate the grittiness of the powder, and I’m telling all my friends and family.